Route from Fort Portal to collection site in video below. Buli wa mamba — awana yiye - "Every catfish owner praises one's own"
Uganda is a country blessed by a number of large wetlands given its relatively flat terrain and the flow of the Victorian Nile through a significant portion of its national territory. An estimated thirteen percent of the country is categorized as wetlands. For the most part, these areas contain heavily vegetated, sluggish waterways. Spilling forth from Lake Victoria, the world's largest tropical lake, the Victorian Nile flows northward until it reaches Lake Kyoga (pronounced Choga). Lake Kyoga is a large depression that is as much a huge swamp as it is a proper lake. The deepest part of the lake is just over five meters (15 feet), but the majority of the lake is less than four meters deep (12 feet). Uganda's wetlands provide a unique habitat for many birds and fishes, but also for a few stranger creatures such as the sitatunga, or marshbuck, a swamp dwelling antelope that will submerge itself in water, with only its nostrils above the surface, to escape predators. These antelope have even been recorded sleeping while submerged in this manner. Well over 50 species of fishes have been recorded from these habitats, they include representatives of five different catfish families. Undoubtedly the most common papyrus swamp catfish encountered is Clarias alluaudi. In fact it is rare to collect in a swampy area in Uganda and not capture several of them. Although some sources claim these fish reach lengths of 35 centimeters (13.7 inches), these claims are almost certainly due to misidentifying this fish with its close relative the larger Clarias werneri. In the wild, I have never caught C. alluaudi larger than 16 centimeters. I have a pair that I captured at about that size, and after a year of captive maintenance, they are still slightly under 20 centimeters standard length (8 inches). This species does not appear restricted to a spawning season as I have captured juveniles, as small as two centimeters, at various times of the year. The author collecting a juvenile in the wild. 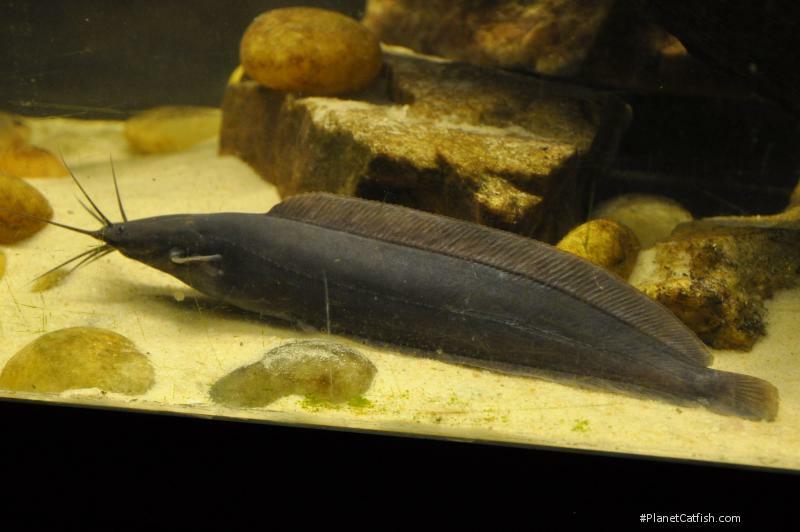 Clarias alluaudi share their natural habitat with several potentially attractive fishes. They are commonly found with Victorian mouthbrooding cichlids (Pseudocrenilabrus multicolor victoriae), Ocellated labrynth fish (Ctenopoma muriei), numerous species of barbs and several smaller species of killifish such as Nothobranchius spp. In area closer to lakes they will also share their habitat with Victorian cichlids. Other catfishes they might be found with include Synodontis afrofischeri, other Clariids, Schilbe and Malapterurus. In the aquarium I have found them to be peaceful, if active (and at feeding time downright boisterous), fishes. While they are certainly capable of eating smaller fishes I have never actually seen them do so, even when kept with newborn livebearer fry. Their natural diet consists mainly of insects, but in captivity they will not hesitate to eat any type of aquarium food offered. In fact, it is more important to make sure their tankmates receive enough to eat before the Clarias gobble it all up. The only time I have witnessed aggression in this fish is when more than one is kept together. I kept two in a 55 gallon tank for nearly a year and the subdominate fish (which was actually the larger of the two) always had minor abrasions from scuffles. The Synodontis and cichlids in this same 55 gallon tank were basically ignored by the Clarias unless they were being knocked out of the way at feeding time. An ideal biotope for these fish would replicate their natural habitat and contain large amounts of submersed and emerged plants. The water would be slightly tinted with blackwater extract and soft with a near neutral pH. That said, I think this species would do well in any set up that was reasonably well maintained. I am unaware of any reported spawning in captivity, but given this species small size it would be an excellent candidate for an attempt at aquarium breeding.